Boston College Professor, Heather Olins (second from left), with her deep-sea biology class at the ISC at URI. Image courtesy of the NOAA Office of Ocean Exploration and Research, Gulf of Mexico 2018. Download larger version (jpg, 3.0 MB). In preparation for the NOAA Ship Okeanos Explorer Gulf of Mexico 2018 expedition, the scientific community was tasked with proposing previously unexplored sites in the Gulf with the potential to reveal new geologic features, biological communities, or archaeological discoveries. 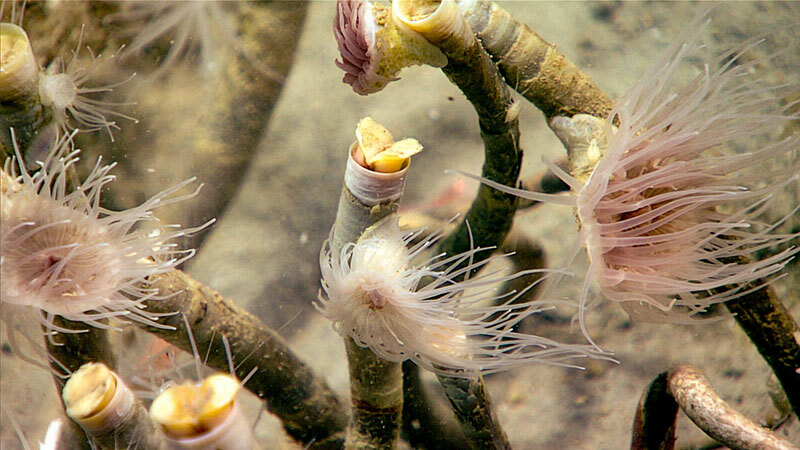 As part of this effort, Boston College (BC) Professor Heather Olins and her upper-level deep-sea biology class were invited to submit two dive site proposals to the NOAA Office of Ocean Exploration and Research (OER) for consideration. This undergraduate class was interested being immersed in the expedition experience, from dive planning to the expedition itself. Guided by NOAA OER staff, the call for proposals provided an ideal opportunity for students to apply what they have been learning throughout the semester to an authentic challenge, get a behind-the-scenes look at the scientific process, be engaged in expedition planning, and participate first-hand in deep-sea exploration. A chemosynthetic community observed during Dive 07 of the Gulf of Mexico 2018 expedition when the BC deep-sea biology students were participating in the dive from the ISC. Image courtesy of the NOAA Office of Ocean Exploration and Research, Gulf of Mexico 2018. Download larger version (jpg, 676 KB). OER staff and expedition coordinator, LT Nick Pawlenko, first visited the class of 37 students at BC with assistance online from OER Science Advisor, Dr. Scott France of University of Louisiana Lafayette, and Susan Haynes of the OER education team to introduce Okeanos Explorer operations. For their assignment, teams of five students submitted plans for potential dive sites to their professor. As a class, they worked together to select their two best proposals to submit for consideration by the science community. The students were thrilled when they heard one of their proposals had been accepted! In total, over 100 proposals were submitted by researchers around the world and reviewed by the science community. The site proposed by BC was selected because the area had not been previously explored and met the overall expedition objectives. The closest historical dives to the site were four surveys by Human Occupied Vehicle Alvin in 2010, which were conducted over 35 kilometers (~22 miles) to the east in Orcas Basin. The site was also en route to the far Western Gulf to unexplored Perdido Canyon, a priority for the science community. The student-proposed dive took place on April 16 as Dive 03 of the expedition, targeting an unnamed ridge to a depth of 1,565 meters (5,135 feet). For more information about what was seen on this dive, read the April 16 Daily Update. 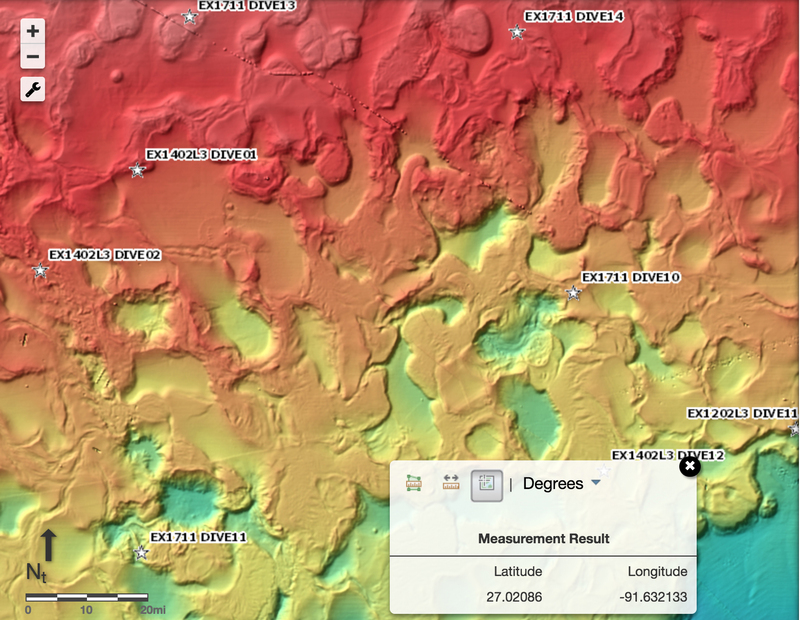 Out of over 100 proposals submitted by researchers around the world and reviewed by the science community, the BC class’s dive site submission was one selected for exploration. This was Dive 03, which targeted an unnamed ridge to a depth of 1,565 meters (5,135 feet), on Monday, April 16, 2018. Image courtesy of the NOAA Office of Ocean Exploration and Research, Gulf of Mexico 2018. Download larger version (jpg, 938 KB). 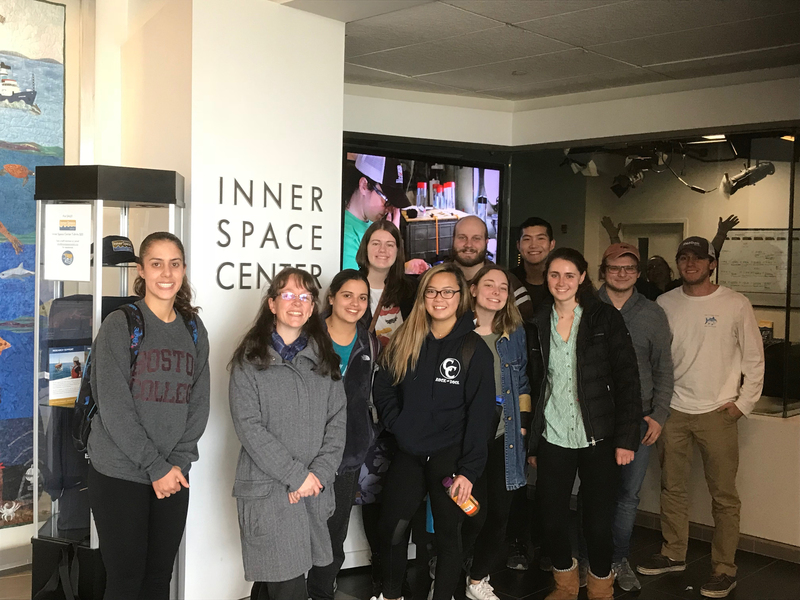 Additionally, 11 students from the class took a field trip to the Inner Space Center (ISC) at the University of Rhode Island’s (URI’s) Graduate School of Oceanography on April 20, 2018. 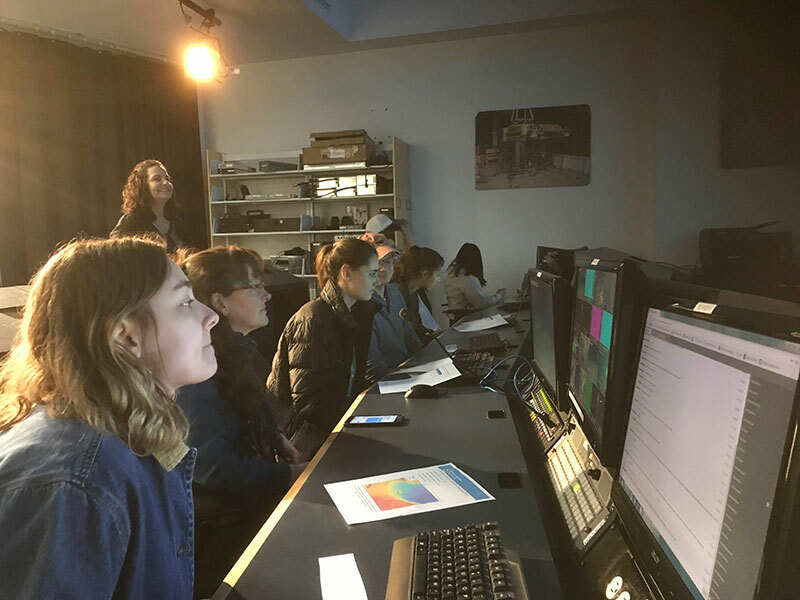 The students had the unique opportunity to spend the day as members of the expedition science team, contributing to online discussions while watching the live video stream on the ISC’s impressive 288-square-foot screen and communicating with the science team on the science conference call as questions arose. They were very curious about everything including deep-sea creatures, the remotely operated vehicles, and the career paths of those both on the ship and at the ISC. The students also had the opportunity to interact live with the onboard science team (Nick and science co-leads, Adam Skarke and Daniel Wagner) while their peers back at BC watched and followed along from school. Boston College students interact live with Gulf of Mexico 2018 expedition coordinator, Nick Pawlenko, and science co-leads, Adam Skarke and Daniel Wagner. Image courtesy of the NOAA Office of Ocean Exploration and Research, Gulf of Mexico 2018. Download larger version (jpg, 3.2 MB). 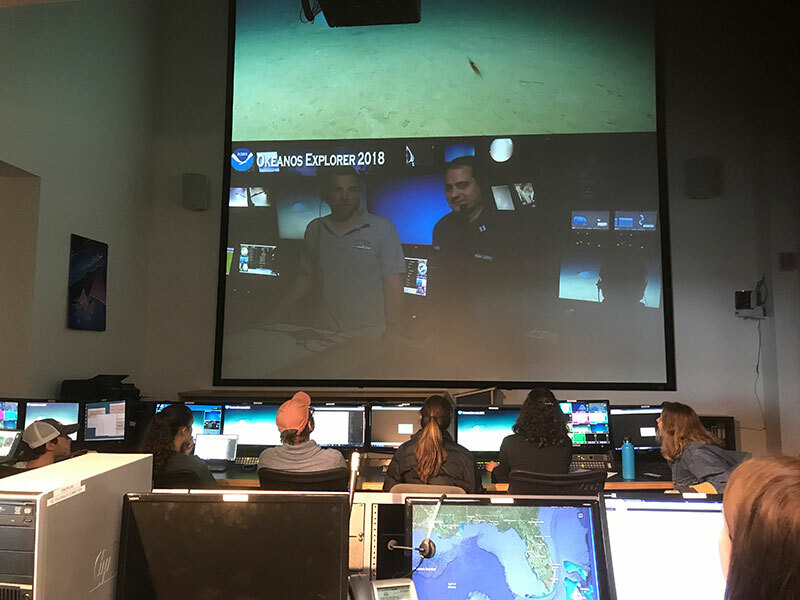 At URI’s ISC, BC students participate as members of the science team during the NOAA Ship Okeanos Explorer Gulf of Mexico 2018 expedition. Image courtesy of the NOAA Office of Ocean Exploration and Research, Gulf of Mexico 2018. Download map (jpg, 3.1 MB). Great questions were posed by the students to the science team as their intrigue grew about chemosynthetic communities, mud volcanoes, and sea cucumbers dancing in the water column. One student noted, “Being immersed in the actual science, talking with the science team online and asking them questions directly is really cool!” Another shared, “This is such a different experience from the classroom and really gives me a higher appreciation for what goes into science and exploration.” Even though these students have grown up in the video age, they were particularly impressed by video quality and resolution. 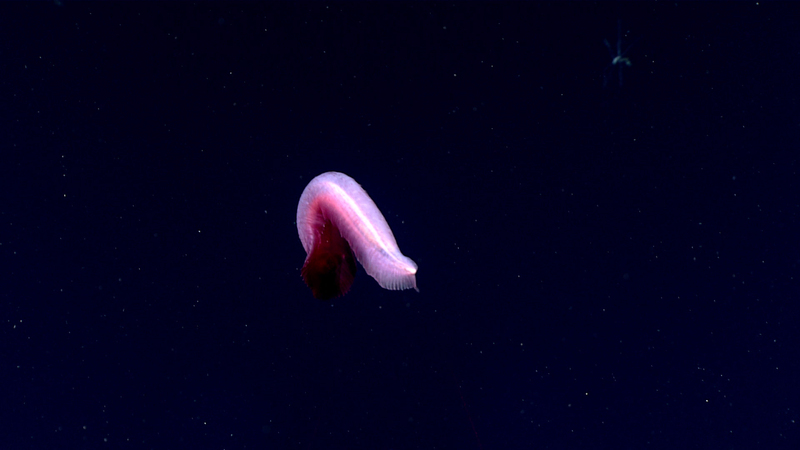 One of the “dancing sea cucumbers” that fascinated the BC deep-sea biology students, imaged on Dive 03 of the expedition. Image courtesy of the NOAA Office of Ocean Exploration and Research, Gulf of Mexico 2018. Download larger version (jpg, 315 KB). The expedition team and staff at the ISC were glad to provide this unique opportunity and hope these students will move forward in their lives and careers with a stronger understanding of the importance of ocean exploration and just how much we still don’t know.